The beekeeper extracted the royal jelly of queen cells in hives available, usually on the 5th day before the closing of the same. 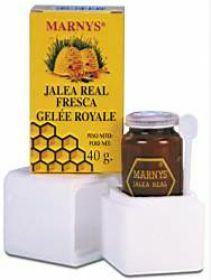 Royal Jelly is a substance produced by worker bees in their first 5-14 days life through glands are in the pharynx. Its texture is creamy white color and has a sour taste. Royal Jelly is the food that bees provide the newly hatched larvae until third day, the queen larvae until the fifth day and the adult queen bee throughout her life. Thanks to its nutritional properties, the queen larvae are formed in 15 days while workers require 21 days, the queen bees reach twice the size and weigh up to 40% more than the workers. Feeding with royal jelly is the only reason that the queen is fertile, live six years and weighs 240 mg, while the workers are sterile, they live only 30-90 days and weighing 125 mg.
Royal jelly is contraindicated in Addison´s disease (chronic renal glands adrenals).